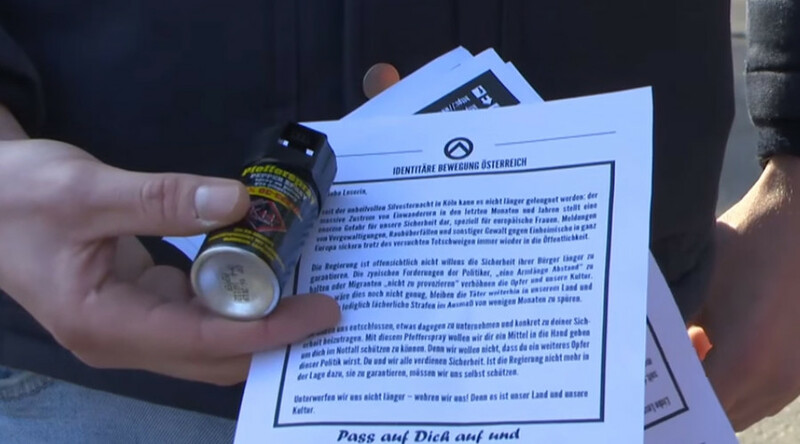 Far-right activists in Austria’s capital, Vienna, are handing out pepper spray cans to women as a way of protection themselves against attacks. The activists say women should be ready for a possible increase in sexual abuses due to the influx of migrants. The cans are being given out by members of the Identitarian movement. "I think it's a great action. Pepper spray is always handy. Good idea,” one of the women pointed out. "If you look at the news nowadays, if you keep in mind the Silvester-night in Koln, I think that many woman have worries," one of the members of the movement said, referring to the New Year’s Eve sexual attacks in Cologne. Police officers could also be seen at the event. Following the reported NYE Cologne sexual assaults, anti-refugee sentiment took over the minds of many Europeans. The demand for weapons and the means of self-defense has been increasing across Europe amid the migrant crisis. In Austria, the number of applications for handgun permits has risen fourfold in the last few months of 2015. In Germany, applications for small-weapons licenses have doubled since the beginning of 2016. The Identitarian movement began in France in 2002. It opposes globalism, uncontrolled immigration, and the practice of the mixing of races. It is said to have played a role for the rise of the PEGIDA marches in 2014/15.